William Paladino is having a very busy season. The CEO of Ellicott Development Co. is overseeing multiple projects in the city and the suburbs, including the construction of a 12-story tower on Pearl Street, the renovation of a six-story Michigan Avenue building and the development of Fairfield Inn in Amherst near University at Buffalo’s North Campus. 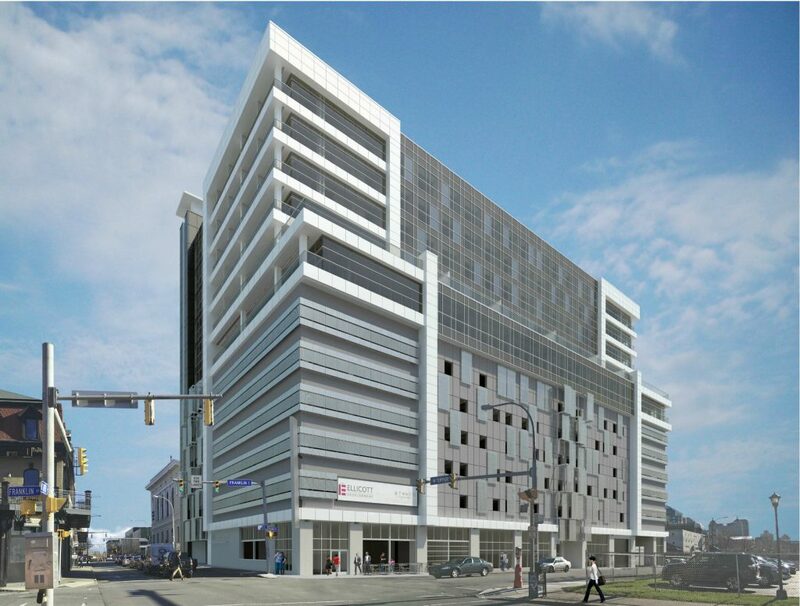 A parking ramp at 500 Pearl is complete, and crews are starting to build six stories of steel on top of the ramp for Ellicott Development’s planned 12-story, mixed-use tower. The project is “moving better than expected,” Paladino said. The project is a 300,000-square-foot complex on a former 100-space parking lot, with six floors of parking, a three-story hotel, 28 apartments on two floors, 12,000 square feet of first-floor retail space, and one floor of 28,000 square feet of office space. The $70 million project is located next to the 70,000-square-foot Buffalo Christian Center building, which will be incorporated into the project to house the main lobby, lounge area, a cafe, banquet and meeting spaces, and a basement pool and spa. Road Less Traveled Productions will also stay in the Forbes Theatre. Some of the project’s commercial space will be taken up by the theater and related entertainment, but Paladino said his company is talking to potential tenants about the rest of the project’s office and retail space, which is still available. He said officials are “close” to deals with some office tenants and said the company is in talks with a couple of restaurants. Work is underway to renovate a former plumbing supply shop on Seneca Street that will house a medical marijuana dispensary and other commercial tenants, as well as apartments. 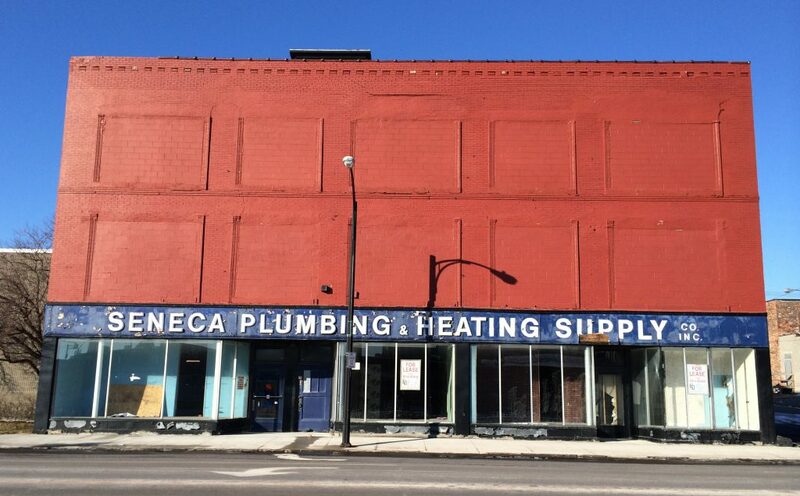 Formerly home to Seneca Plumbing & Heating Supply, the three-story building on the north side of Seneca Street at Michigan Avenue is being converted into a combination of commercial and residential space. Plans call for 9,000 square feet of commercial space on the first and second floors, with four market-rate apartments on the third floor. A connected warehouse has another 4,000 square feet of available commercial space. A new medical marijuana dispensary will occupy the first floor space, while a second tenant will take up most of the warehouse. There are “early-stage discussions” with a tenant for the second floor. Crews have cleaned up the building’s outside and installed new windows in openings that were previously bricked off on the upper two levels. Paladino said the project should be finished by spring, but the first occupants will move in sooner. Ellicott is turning a six-story building at the corner of Michigan Avenue and Seneca Street into a blend of commercial, retail and residential uses. The tallest of three buildings in a larger complex, it will have storefront space on the first floor, warehouse and office space above, and six apartments spread across three floors. The project will use historic tax credits. The state Department of Environmental Conservation occupies part of the building, and Paladino said the developer is working to refine its lease. The company still has two more floors of office space left, with no takers yet. 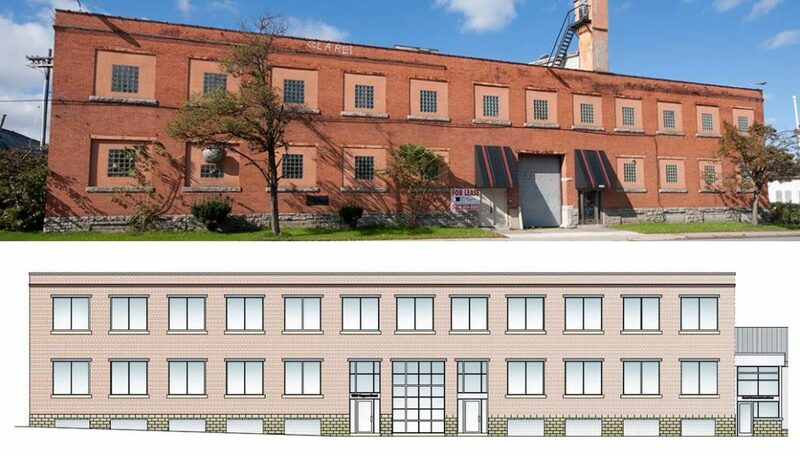 Located between the Niagara River and Niagara Street, a three-story building that once housed Niagara Lithograph Co. will house 45,000 square feet of office and medical space, as well as self-storage and apartments. So far, Lake Shore Behavioral Health and a Kaleida Health pediatric practice from Women & Children’s Hospital of Buffalo have signed leases to fill up much of the commercial area. Almost 10,000 square feet is available on the first floor and another 5,800 square feet in the front of the building on the second floor. 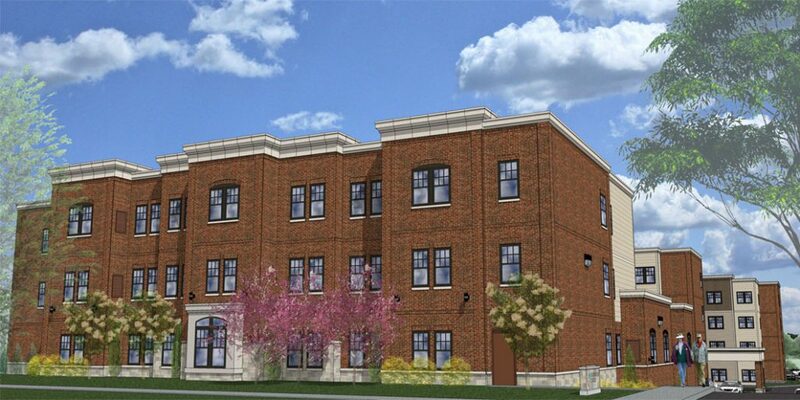 The lower level will have self-storage units, as well as six market-rate apartments overlooking the Niagara River. Crews are replacing the windows with new ones to match historic windows that were previously removed and filled in. They’re also restoring original hardwood flooring and wood ceilings under state and federal historic preservation guidelines. Paladino’s expects to begin construction next month on the former Nazareth Home on North Street near Symphony Circle. The company plans to transform the 3.6-acre former nursing home into Symphony Circle Active Living, an upscale independent-living facility for seniors. The project will feature one- and two-bedroom units, with full kitchens, in-unit laundry, housekeeping and other amenities that include chef-prepared meals, scheduled activities, transportation, concierge services and an emergency response system.